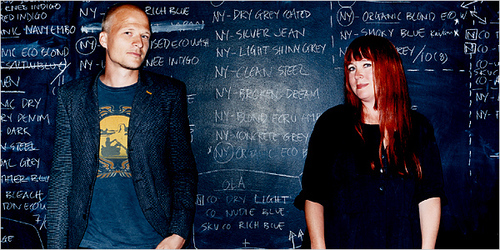 You are currently browsing the Creative Class blog archivesfor September, 2007. Meanwhile, two types of cities are emerging as new centers of art and cultural creation: First, the new urban giants of the developing world such as Bangkok, Shanghai and Mumbai, but also Mexico City, Sao Paulo, Rio, and Buenos Aires, Johannesburg and Dakar. As they grow and mutate, these cities are open and messy enough to provide artists with interstitial spaces they can takeover and make their own. Then, smaller cities such as Philadelphia, Zurich, Barcelona or Goa are also becoming increasingly attractive to artists. They often offer lower rents, wider space and a better quality of life. Thanks to the relative democratization of communication and transportation, creative people can now really be in touch with the rest of the world while living in places better suited to their budget and aspirations. However all of these cities are also on a global track of urban transformation and integration into the established art scene. The creative industry is well on its way to connecting these new spaces and transforming them into expensive and exclusive zones of networking. The Milken Institute does it again. 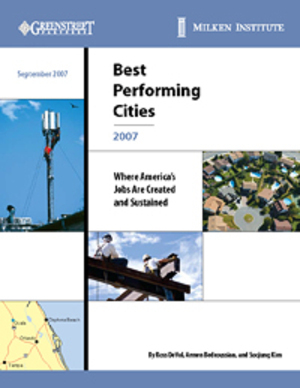 It’s 2007 edition of "Best Performing Cities" was just released. Kudos & props to Ocala Florida and Wilmingon NC (#1 and #2 respectively). The Best Performing Cities Index is outcomes-based. Its components measure job, wage and salary, and technology growth. The Index ranks U.S. metros based on their ability to create and sustain jobs. It includes both long-term (five years) and short-term (one year) measurements of employment and salary growth. There are also four measurements of technology output growth, which are included because of technologyâ€™s crucial role in regional economic growth. Yet another way to measure prosperity? It’s still focused on "trailing" indicators. We like our overall measures which include talent (Creative Class) and tolerance (inclusiveness) and help serve more as a "leading" indicator. You can get the full report here (free sub required). According to these prototype estimates, in 2005, real GDP by metropolitan area grew in 327 of the 363 metropolitan areas. Growth in real GDP by metropolitan area in 2005 was strong along the western and southern coasts (Chart 1). Growth was particularly robust and widespread in the metropolitan areas located in Florida. In contrast, the metropolitan areas near the Great Lakes did not perform as well. When ranked by current-dollar GDP, the New York metropolitan area would rank second among states and 10th among countries in 2005. There are many ways to measure "prosperity" and GDP is certainly among the most common. We’ve been waiting for these numbers to become available. But, now the question is not which regions are growing the fastest (GDP is obviously increasing with population and firm growth), but which regions are the most productive (GDP per person) and what is happening to productivity growth? What other questions should we start looking at now that this data is available?? I guess I thought Rise had reach, but this one really surprised me. 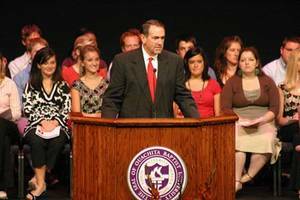 GOP Presidential candidate Mike Huckabee recommends it t o students at Ouachita Baptist University. The story in the Bapist Press. “The one cultural norm that transcends all of the generations, all languages is the transmission of our culture through our art forms. It is the one way in which one generation speaks to the next,” Huckabee said. “It makes perfect sense when you think that even in the way that God designed us, we were designed to be creative. After all, if He is the Creator and He has made a creation and we have been created in His image, it would be the logical conclusion that in His image, since He’s a creative God, that part of what He has created in us is a creativity that ought to be stimulated and enhanced and somehow not put aside,” he added. A former Ouachita trustee, Huckabee recommended that students read a book by Richard Florida, “The Rise of the Creative Class,” in which the author predicts that the future economy will be driven not by those who are strong in technology, agriculture or manufacturing but those who are creative. “The accommodation of the creative class really is the foundation for the future of our nation’s economic strength,” Huckabee said. This picture really is worth a thousand words. But do look at Tyler Cowen’s comments on Paul Krugman’s original post. 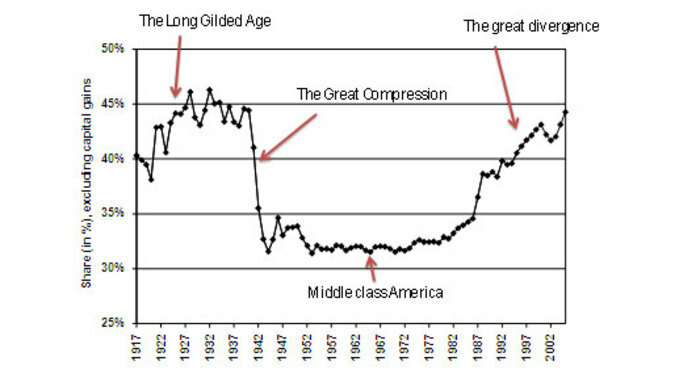 My own two cents is that this shift, like the one before it (the long gilded age) is a consequence of a major economic shift, in this case the shift from the industrial to the knowledge-based or creative economy.Â I date the emergence of the modern creative economy at roughly 1980. Since that time the US has created roughly 20 million jobs in the creative sector of the economy – everything from science and technology to arts and entertainment and the professions.Â Such major shifts, as Marx and Schumpeter long ago argued, open up whole new industries and whole new sources of wealth. Left to their own devices, economic divergence is a natural consequence. New institutional arrangements are required to bridge these gaps. In the post-World War II world it was mainly about unions and social democracy.Â Like them or not, such institutional arrangements worked because they allowed the top to expand while the bottom gained some share of economic prosperity.Â And like them or not, there is no going backward here: The old post-war institutional landscape simply will not work in the creative age. But one thing is obvious: “Lopping off the top” would be an unmitigated disaster, stopping economic growth in its tracks. The great unanswered question of our age is what will do the trick – what kinds of institutions can square the proverbial circle in the creative age, enabling the peaks of the creative economy to expand while pulling up its valleys. The alternative is not pretty. Well, not really. I was there for a great visit to Iowa State last week. AndÂ I met two of our favorite CCG alums, Amanda Styron and Jesse Elliott. Richard Doak came to my talk and makes some great points in this piece from Des Moines Register. Let’s just give up trying to promote Iowa.Â Then let’s abolish the state Department of Economic Development.Â Finally, let’s erase the state’s borders. Let the state fade into a general region known as the Midwest rather than remaining a rather small, arbitrarily created governmental entity known as Iowa. That’s silly, of course. Iowa can’t disappear from the map. But it might be useful to conceptualize that happening. Iowans need to start thinking more regionally – not just regionally within the state but regionally across state lines. We should begin to see ourselves as a part of something bigger – the Midwest. That thought occurred last week while listening to a guest lecture delivered by economic growth expert Richard Florida at Iowa State University. … Florida’s great discovery was that economic growth occurs in regions that are most inviting to creative people. That’s what revolutionized thinking about economic development. The smart thing to do would be to take all the money wasted on business incentives and plow it into education and quality-of-life improvements. … The hitch is that Iowa might be too small to pull it off alone. The regional nature of growth suggests that Iowa will fare best as part of a larger region, not as a small state trying to go it alone. Besides, Iowa has never had much success trying to sell itself as an entity. The state has tried for decades to improve its national image, only to get poll results that show Iowa has no image. The state barely registers in the national consciousness. Trying to pitch Iowa as a sanctuary for creative types might be a tough sell. Why even bother? Why not stop trying to sell Iowa and start selling the Midwest? Imagine all the states of the Upper Midwest getting together. They could swear a non-aggression pact on business incentives and merge their state universities into one mega system, combining them to make a gigantic dynamo of economic growth. Then they could join in a massive campaign to market the Midwestern lifestyle to the rest of the nation.They could sell this as the best region in America, because it would be. Amen, Richard! And Iowa is already connected to the world’s third largest mega-region, the great Chi-Pitts mega running from Pittsburgh through Cleveland over to Detroit, across to Chicago and Minneapolis and into Iowa. of the country or see how your current city compares to others. 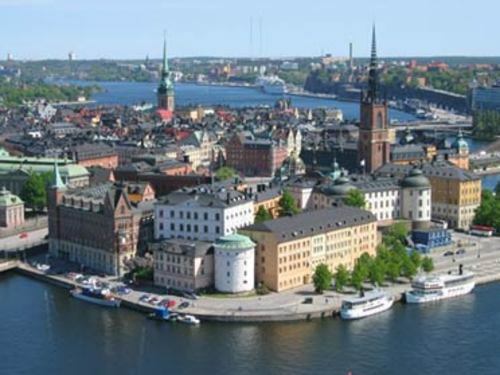 Here’s a link to the Reader’s Digset study of the world’s greenest locations courtesy of Matthew Kahn one of the study’s principal authors.Â Below is their ranking of the World’s Greenest, Most Livable Cities. Many interesting findings here, particularly New York ranking as America’s leading green, liveable city. Would be cool to compare these to our creativity rankings: I’m always being asked how my rankings stack up to environmental sustainability. Stephen Metcalf has a fascinating article on Sweden’s “second city” in the NYTimes special magazine, The City. This bit made my day. On my second day in the city, at an annual art exhibition-rock concert-barbecue called Warm Up!, a young Swedish gangsta in a hoodie, stinky sneakers and aviator specs asked me if I had heard of Richard Florida. Florida is an American economist and urban theorist who believes that the presence of a â€œhigh bohemianâ€� class, of artists, musicians, high-tech workers and gay men and women, drives economic growth more than sports stadiums or iconic architecture. When I called Florida, he was elated to discover that Swedish club kids cite his work and quick to return the compliment. â€œLook, England ruled the world, and it was a tiny island,â€� he said. â€œIt’s possible the world is going in the opposite direction of the big state.â€� Florida believes a small, well-educated, super-value-added country like Sweden could thrive and influence the world, or some portion of it, by being a knowledge-workers’ paradise. Can Architecture Save a City? 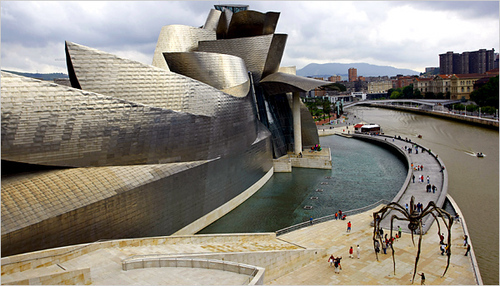 Denny Lee ruminates on how a great piece of architecture – Gehry’s Guggenheim in Bilboa – affects the soul of a city. On paper at least, Bilbao seems to have it all: world-class museum, fine Basque cuisine, a rollicking night life and lots of shopping. But like the new bike paths that were rarely used during my visit, the city lacks the critical mass of attractions to take it from a provincial post-industrial town, to a global cosmopolitan city. And in the meantime, it is losing the shabby edge that gave the city its earlier appeal.